March 16, 2011 by Katherine Hajer in "health"
With the major exception of dark chocolate, I'm not a big sweets person. I actively dislike boiled sweets/hard candy, and a lot of the desserts on menus leave me cold. I mean, honestly, so you threw a bunch of brownies, fudge, and caramel on top of a chocolate cake and called it "sinful" — I don't believe in sin, and it's just not that good. You can't just pile a bunch of sweet stuff on top of each other and claim it's a tour de force. My favourite restaurant dessert, which I have had at a restaurant precisely once, is three fresh strawberries dipped in dark chocolate. That's all anyone needs if the rest of the meal was good. A few weekends ago the ever-knowledgeable J-A and I ran errands on Queen West, and we had Indian food for a late lunch. I'm used to Mumbai Indian food, which has enough heat to please most people, but isn't overwhelming. Our food was well-prepared, but it was so mild I had to wonder if there was any spices used in it at all. J-A suggested we go to Dufflet's for dessert, and I said that sounded like a great idea. I figured I'd just get a cookie or something small. Dufflet's was packed to the rafters when we got there — not surprising on a rainy Saturday afternoon. So we trooped over to the Red Tea Box instead. I'd never been before. I didn't even know it was a place you could get tea and dessert at. From the streetcar, it always looked to me like a very impressive cake-decorating place (although of course they do that too). Inside was like an art gallery by way of a tea shop. J-A checked that a table was free while I wandered around the part of the floor where they sell cookies and other goodies to go. There were square cookies iced to look like pictures of Japanese cherry blossoms, gingerbread men iced to look like little Japanese girls wearing kimonos and cute smiles, petit fours with pictures of pandas. Every single piece was amazingly well-crafted. We took the outside customer's route to the back building where the tables & chairs were, and were seated at a table with vintage overstuffed porch chairs on either side of it. J-A ordered a mulled pear drink with a fruit tart, and I got black assam tea with a honey saffron cake. Yes, that's a cake. 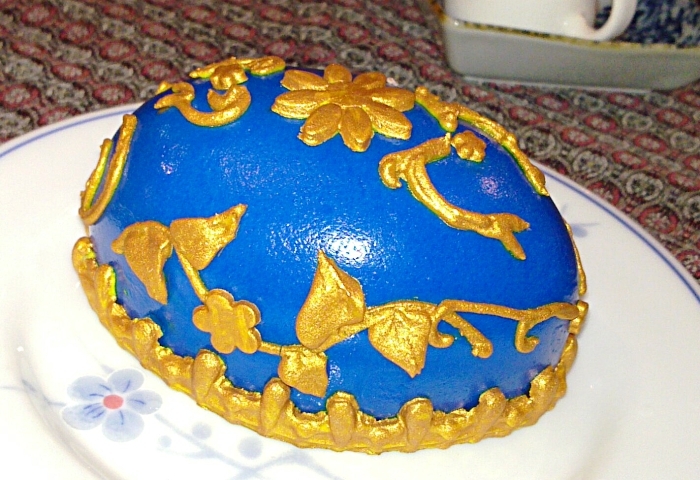 And those decorations on it are royal icing made with 24 karat gold. It was several minutes before I could bring myself to cut into this, it was so beautiful and perfect. The blue icing came off the cake in one colour-saturated piece, but I ate it anyways (and turned my tongue and teeth blue, which was fun in and of itself!). The cake inside was light and flavourful, and the honey saffron cream filling was gorgeous. Was it expensive? Yeah — the beverages and desserts came out to $17 per person for the two of us (the honey saffron cake alone was $12). But as affordable indulgences go, that's not too bad. That's 9.6 Kit Kat bars out of the vending machine at work. The one-time experience of eating this cake was far more enjoyable than 9.6 Kit Kat bars spread out over the course of several weeks. I'd rather just remember eating the cake than have a Kit Kat bar, and I used to really like Kit Kat bars when Rowntree still made them. I can't see myself going for something like this more than a few times a year, but each time will be very much appreciated. This is what a treat is supposed to be like, people. Help, please: Somewhere on the interweb is a wonderful video about a woman who is just finishing lunch with her new boyfriend when he has to leave early. He tells the server to let the woman have whatever else she wants for lunch and to put it on his credit card. She then agonises (in a very, very funny but true way) about whether or not to have some cake for dessert, finally decides to indulge, and is just getting into the cake when her boyfriend returns... but I won't spoil it for you. What I need is to find this video again. It is absolutely hilarious, but it's funny because it's true, true, true. I've just tried Googling for it, and am coming up with nothing. Anyone have any leads? Please? Pretty please?